When the properties are of text and/or numeric types – string, int, double, float and so on – the process it’s pretty much straightforward, expecially if they end up into text boxes using the Html.TextBoxFor() or Html.EditoFor() methods: it’s not that easy when we need to translate a nullable boolean type property ( bool? ) into a DropDownListFor or a CheckBoxFor : how to ensure that the values will be properly translated between the ViewModel and the HTML? The only downside of this workaround is that the null value will be treated as false: if you can’t accept that, it’s better to use a control that can support three states, such as the aforementioned DropDownListFor . All the above suggestions and workarounds are fully working in MVC 4, MVC5, MVC6 and ASP.NET Core MVC. Many thanks to this great article written by Brad Wilson for the insights that led me to write this post! ASP.NET – How to format and style a Excel XLSX Worksheet with EPPlus A brief tutorial explaining how to apply styles and format rules to a Worksheet created with EPPlus: bold, colors, auto-filter, auto-fit and more! Previous Article ASP.NET Core 2 and Angular 5 book available for preorder on Amazon! 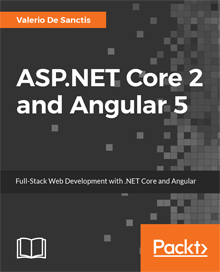 ASP.NET Core 2 and Angular 5 book available for preorder on Amazon!